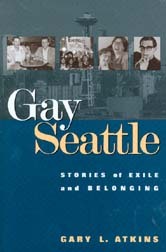 This excerpt, from Chapter Four “Stirrings of Resistance,” chronicles the start of lesbian/gay resistance to the police in Seattle by bar owners who took the courageous first step of filing a lawsuit to stop police harassment of their taverns. A court order would put an end to some of the outright harassment of gay patrons — but not stop a long-entrenched payoff system. It was Boxing Day in Canada, when Christmas gifts are stored and alms passed to the poor. In 1957, MacIver Wells and John Chadwick had other boxes to worry about. They had just driven south from Vancouver heading for Seattle and a new life. It was time to unpack. Mac, as he was always called, had been born in Quebec, that first name a reminder of his mother’s clan from the Scottish Highlands. John had grown up in Alberta. In the early 50s, the two had met in a beer parlor in Vancouver. When they accidentally saw each other again on a city bus, they began a relationship that would until last Chadwick died 44 years later. Mac was in his 30s, working as a prison guard, while Chadwick was in his 20s, selling retail goods for the Woodard chain. Both dreamed of operating a business where they and their customers could be openly gay. In Vancouver, they had tried managing a steam bath, catering to straight businessmen during the day but encouraging gays to come at night. Chadwick had eventually been disgusted by the hypocrisy of some of his closeted customers, the final straw coming, he said, when he had admitted a closeted priest who paid with money from his Sunday collections. The two decided to head south to realize their real ambition of starting their own gay bar. In Canada it was too hard to secure a license. “You had to be part of a hotel then, with a certain number of rooms,” Mac explained during an interview in 1992. When the women started to arrive, Chadwick redecorated the Madison. He decided it should look like a French sidewalk cafe. He and Mac placed awnings over the bar and hired one of the “girls”–their word–to paint wall murals of French street scenes. The tables sprouted red and white-checkered cloths as well as a romantic touch with candles burning in glass containers. “It was different compared to the run-of-the-mill taverns [on the mud flat],” Chadwick said. “Picturesque, I guess you might say.” Then a decidedly unromantic event occurred. One day while Mac was working the bar, a Seattle police officer walked in. He chatted pleasantly for a few moments, then mentioned that he had noticed the Madison’s clientele had changed. Mac listened. For $30 a month, the beat cop said, the lesbians could be left alone, even given some “protection” against heterosexuals who might want to harass them in the bar. Neither partner had ever encountered such a suggestion in Canada. “In Canada,” Mac said, “your business was your castle–a policeman didn’t ever enter without your permission. Down here, it was a shock. A policeman could come into your tavern and do what he liked.” Mac soon discovered it was not uncommon for a Seattle police officer to make such suggestions. The payoff system had begun at least by the late 1890s, when John Considine, faced with the barmaid ordinance that prohibited women from serving drinks, began enriching patrol officers for their tolerance. Once prohibition ended in 1933 and new restrictions were put on saloons and gambling, police officers and inspectors had great leverage in deciding whether the lights inside a tavern seemed bright enough, whether views from sidewalks really were unobstructed enough, how often customers should be carded for age checks, and whether any singing or dancing by the clientele was impromptu or sufficiently a part of the bar business to require a different, more expensive cabaret or dance license. Later, in King County court records, it would be revealed that during the 1950s and the 1960s, the bar manager at the Double Header, John DelleVitti, had been required to pay the beat cop $60 per month. At his underground Casino, he had paid $100 every weekend it was open. By the 1960s the police were collecting almost $6,500 a year from the two gay gathering spots. At a nearby cocktail lounge at Second and Yesler, the Mocambo, the owner Ivan Prather would be approached by police officers in 1959. Prather paid $100 on the first of each month, according to the court records. He also started paying $50 per month to state liquor inspectors. Seattle police officers then demanded a raise, to $150 a month. Prather told prosecutors he eventually negotiated a different deal: $60 per month and two bottles of Old Hermitage. A block north of the Double Header, when Albert Romano had opened the Submarine Room in the basement of the Smith Tower, he had found his license application blocked until he agreed to pay $100 per month to beat officers. At one of the oldest steam baths on the mud flat frequented by homosexual men, the South End on First Avenue, the owner Edwin McCleary had been told to pay $75 a month. Eventually, according to court records, a patrol officer informed him that he had “too good of a thing” and the price would rise. McCleary was soon paying $200 per month, delivering the money in three separate envelopes, one for each police shift. The bribes worked like a pyramid scheme. Prosecutors would later allege that beat cops collected the cash and split the pay with their shift sergeants, who in turn divided with captains. How far up the money went was a matter of speculation. Unlike John Considine, who in the 1890s claimed to have followed the police officer he had paid and seen him deliver the money to police chief William Meredith, gay bar owners could only speculate about where their cash went. The payoffs could also take different forms. Mac said he was once told it would be highly advisable for him to buy a couple of spaces at a fundraising party for the governor. Mac tried to reason his way out of the suggestion by saying that he and Chadwick were still Canadian citizens and could not even vote for the governor. The cop, unimpressed, dryly replied that a donation directly to the governor’s campaign would still do. Other times, the payoff came in the guise of “voluntarily” hiring an off-duty policeman to be the bar bouncer and door checker. Although it was cheaper to assign a tavern employee to the door, the bars for homosexuals often were not allowed that choice…. Mac and Chadwick stopped making payments. More weeks passed, and then without warning police suddenly started raiding the Madison, entering unannounced and demanding to see everyone’s identification, harassing homosexuals by threatening to report them to their employers. One Friday, October 3, 1958, was especially bad, according to Mac. Two police officers walked in and questioned the customers, ostensibly about their age. They walked out the door, then returned six minutes later with a sergeant and started the questioning all over again. Intimidated, every person in the bar left. Within a short period, the Madison went from making profit to losing $350 a week. Both Mac and John were confused. They had simply followed instructions. Yet suddenly, it seemed, the police had decided to make the Madison a target. Uncertain what to do, Mac relied on instinct–which for him meant, fight back.